The story behind the name FATE is essentially the same story told across many cultures. According to Wikipedia, Moirai is a name of the 3 sisters – or fates – who in Greek Mythology were said to have the power used to control the destiny of human beings. This interpretation of fate was believed to be determined by 3 sisters; Clotho, who spins the thread of human life; Lachesis, who measures and in some translations determines Destiny (i.e. the thread of life) and Atropos, who cuts the thread of life. 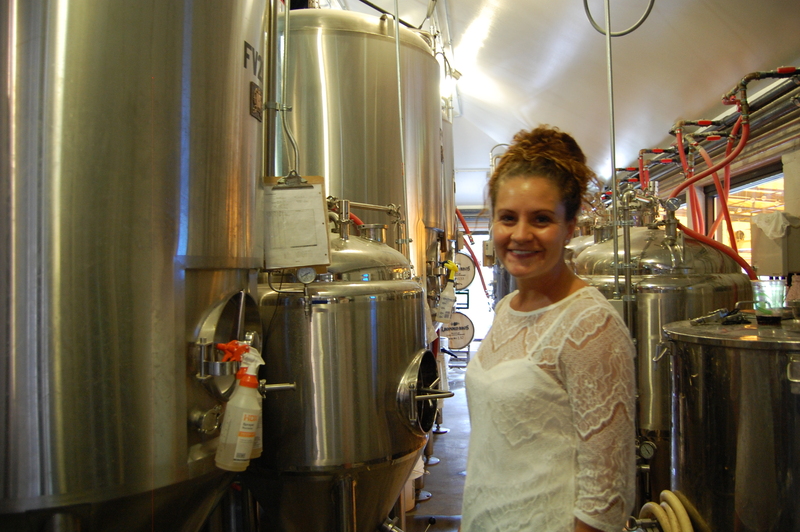 Moirai is also the brewery’s best-selling beer, (Moirai IPA). Not only does this beer’s name carry a deeper meaning, but all of FATE Brewing Company’s beers are named after a different story in mythology. 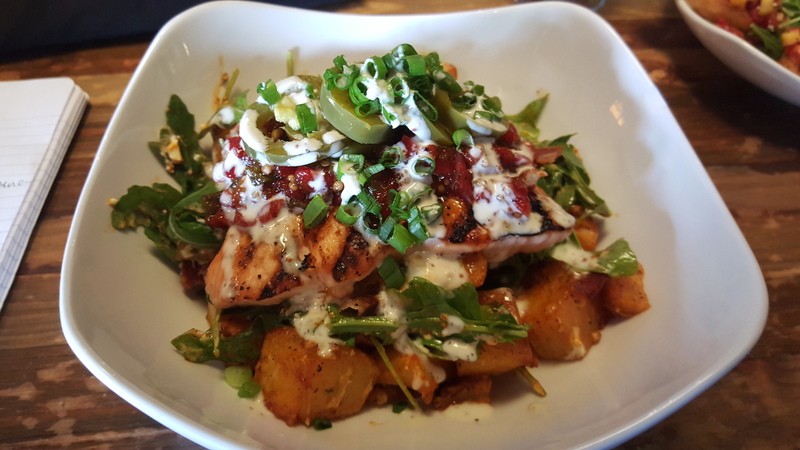 Fresh Grilled salmon served on top of warm potato salad, topped with peppered bacon, chevre goat cheese, scallion dressing, arugula, pickled jalapeños, pepper relish, white BBQ sauce. Photo by Rachel Dugas. When FATE founder slash owner Mike Lawinski – who spent a decade with Big Red F Restaurant Group working as operations manager for Centro Latin Kitchen and West End Tavern – set out to open his own brewery and restaurant, he relied on a twist of fate. 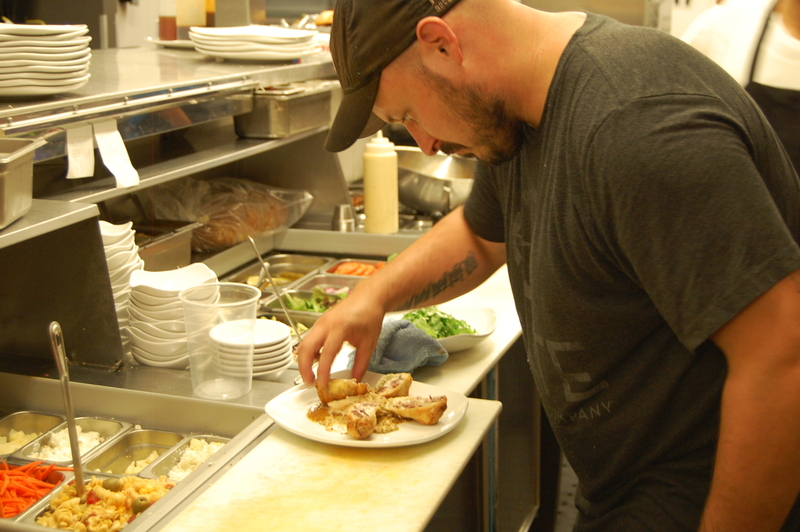 Lawinski hired Tim Berry (who worked under him at West End Tavern) to become his new Head Chef. Together, the two developed a full menu – including brunch – of satisfying upscale comfort food and BBQ. and bitter which tantalize each of the five senses – sight, sound, touch, smell and taste – which are sure to please all Nine Muses. his grandfather operated a concession cart business, the chef said he incorporates foods he grew up on as a kid. A prime example is FATE’s signature Pastrami Egg Rolls – which play homage to Christmastime with his family. The chef described a time when his family devoured beef roll-ups stuffed with pickles and cream cheese. The updated version combines house-smoked-melt-in-your-mouth pastrami (the best pastrami I’ve tasted in Boulder) with pickles and herb cream cheese rolled into an egg roll paper and fried to deep golden perfection. The result is all those sumptuous flavors harmonizing together in one crunchy, deep-fried vessel. The roll delicately rests on top of three different types of mustard with a garnish of house-made kraut. One bite and you taste everything yummy, scrumptious and comforting – crunchy, salty, creamy, tangy, and intriguingly complex – I would definitely recommend this starter and would add I haven’t tasted anything like it in Boulder before. So besides cooking foods he enjoys, what other secrets do the FATE kitchen walls hide? Chief Operating Officer Alyssa Lundgren said Chef Tim’s warm personality is what separates him from the pack. “Tim is such an amazing person, he’s so creative,” she elated. In addition to working with the front of the house to design dishes that either incorporate or compliment FATE’s signature ales, she explained that the kitchen makes all sauces and condiments from scratch, including the barbecue, which is slow-smoked using all real wood (no charcoal briquettes in sight) on a custom-made Yoder Smoker. (Chef Tim even brings his personal smoker to work on occasion to ensure not even one slice of precious barbecue ends up in a rudimentary oven.) This is arguably the best barbecue in Boulder, but don’t just take my word for it. Chef Tim’s smokes meats have landed FATE several wins at food competitions including Best Overall BBQ and Best Ribs at the 2013 Lafayette Annual Craft Brew and BBQ Festival. FATE Chief Operating Officer Alyssa Lundgren. Photo by Rachel Dugas. Come for brunch, and if you do, bring the human offspring – kids eat free on weekends before noon. Stay for Happy hour (M-F 3-5:30) and enjoy Pastrami egg rolls for less than half the normal price. Come for dinner and try a Core Flight for only $7, but save room for dessert because they have an amazing one! FATE’s Coffee IPA Ice Cream Sundae is simply irresistible. Photo by Rachel Dugas. 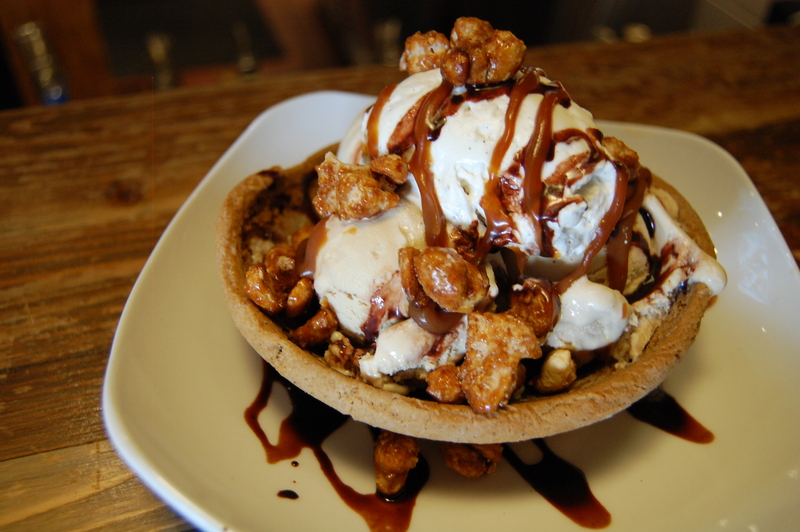 that’s not all – the entire thing is served in a 100% edible maple-molasses cookie bowl. This is NOT your ordinary sundae – creamy, crunchy, sweet, bitter from coffee, addictive – this sundae is intoxicating, but not from the alcohol (only trace amounts of alcohol is left in the actual ice cream). Chef Tim wasn’t the only twist of fate the brewery has experienced. The Boulder brewery opened its doors in March 2013. Little did they know another brewery with the same name was in the process of opening. Fate Brewing in Scottsdale, AZ – a small-batch brewpub – opened in January 2013, but FATE’s COO said the two breweries have since resolved their ‘ill fate’. Speaking of the ambrosia of the gods, let’s take a moment to invoke Dionysus the Greek god of wine – or perhaps we should give thanks to Demeter – goddess of the harvest, especially grains – for without the finest grain of all – barley – Head Brewer Jeff Griffith wouldn’t have beer to brew. Head Brewer Griffith hails from Golden City Brewing (8 years), and took home Gold at GABF in under 2 years as head brewer for FATE with his German-style kölsch ale Laimas (2014). Griffith attributes his success to good equipment, good beer culture in Boulder and his time at Golden City. Jeff is totally humble about the medal and considers it more a luck of the draw as opposed to technical mastery. “Beer competitions are hard, (judges) are very subjective – there’s no guarantee,” he said about the competition world. He said FATE is going to attend GABF in September but he doesn’t have any expectations. “There are 90 entrants, what is the chance of being in the top 3?” he dismissed. GABF isn’t the only bragging rights the brewery has. Bon Appétit magazine voted FATE Brewing as one of the 10 New U.S. Breweries to Watch from D.C. to California and RateBeer.com described it as Best New Colorado Brewery. FATE Brewing incorporates two distinct brewing methods, which allows them to create a wide range of beers. Photo by Rachel Dugas. FATE’s equipment started with 102-barrel fermentor space; now the brewery has grown 84% with the addition of six new fermentors and one 30-barrel bright tank. Their small-batch “nano” brew system (used for making specialty brews or collaborations like their ‘Local 900’s Thor Strong’ cherry wheat ale of which $2 from every pint goes to MDA Rocky Mountain) increased its capacity to 18 barrels at any given time. Their 3-vessel, 10-barrel, decoction method brew house now sits alongside the two new 30-barrel fermentors and two 10-barrel fermentors. 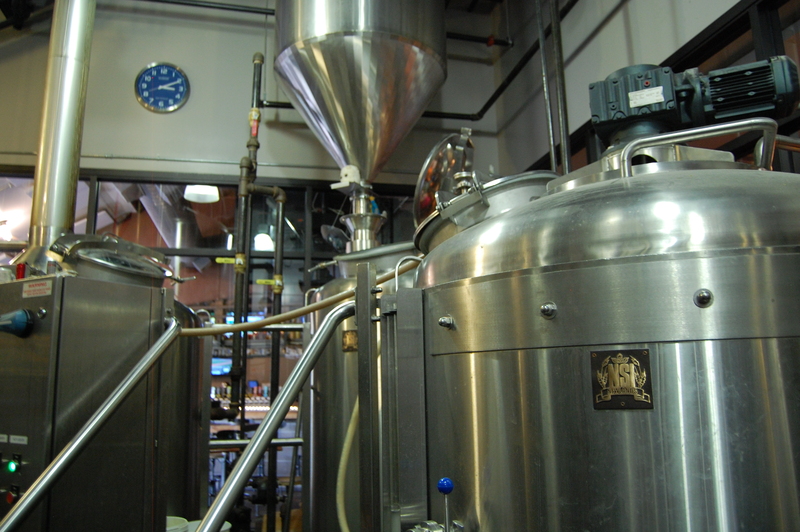 These systems allow the brewery to produce a wide range of beers. With only 15 to 18 of their 30 tap lines serving their own concoctions, FATE has plenty of space to keep guest brewery taps in constant rotation. 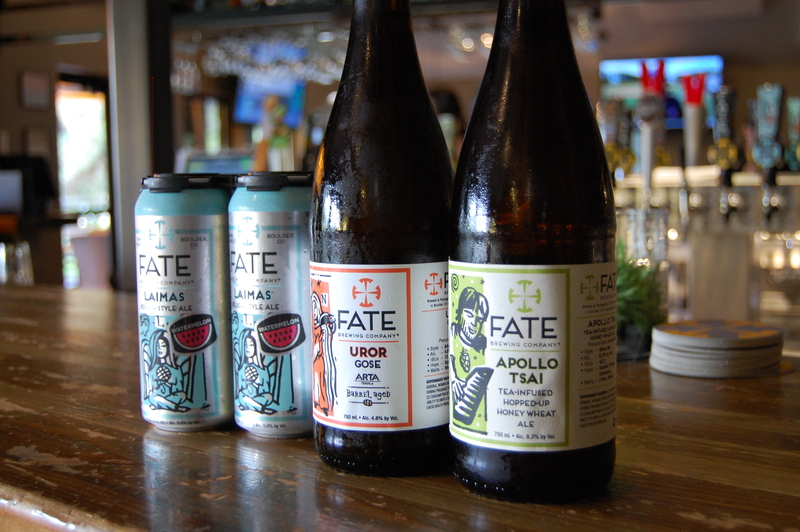 Business is booming, with the brewery currently at capacity – and in the process of expanding – FATE beers are being sold off site at over 200 retail locations, with 3 new canned varieties soon to be released. Artist’s rendering of FATE Brewing’s future barrel room and private bar. In addition to their award-winning kölsch, FATE is also adding to their line of barrel-aged beers (barrel aging is becoming one of the biggest trends in the craft beer industry). In order to meet growing needs, FATE is expanding into a 2,500 square-foot space adjacent to the brewery. The new space, planning to open in late Fall/early Winter 2016, will accommodate oak barrels for aging and storage for their canning line. The new space will also have its own bar, making the space ideal for intimate gatherings and private events. Who knows what fate has in store for the folks at FATE? Only time will tell. All we know is we will be keeping a close eye on this bustling Boulder business. FATE Brewing Company provided this writer free samples of beer and menu items for tasting.